What’s memorable: Oh, that hacking. At 20 years old she can’t breathe, has to use a nebulizer several times a day just to survive. Also, the strange relationships with her mother & aunt, the snorting off the sidewalk using a tampon applicator. Official Synopsis: Ashley was raised by a mother who was addicted to methamphetamines and gambling. 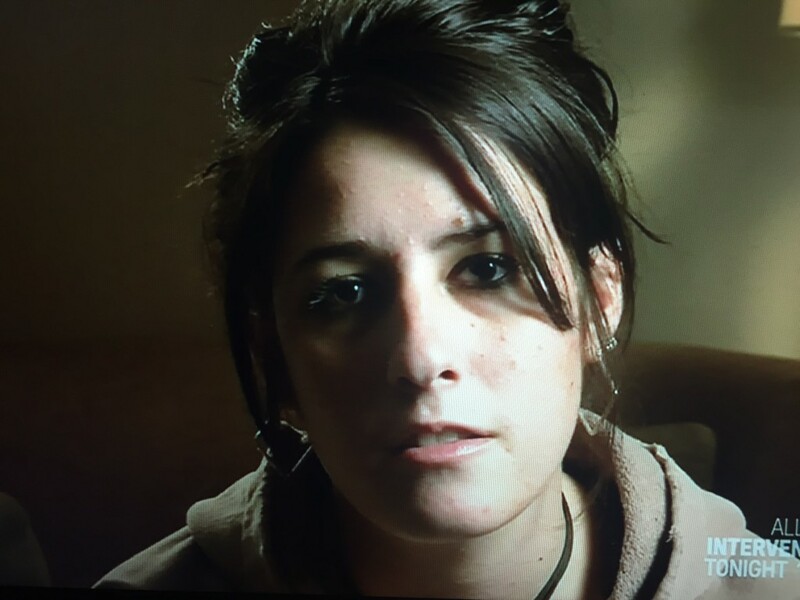 Ashley flourished when her aunt and uncle became her legal guardians, but she started using heroin when her beloved grandfather died. Now she bounces back and forth between her rigid aunt’s house and her permissive mother’s house, and she’s developed serious asthma from smoking heroin. The family fears that Ashley will soon overdose and die. Just watched her episode. beautiful girl, so heartbreaking to see her do what she is doing to her lungs, body. If anyone has any updates, I’d love to know how she is doing. I can’t find anything on her really, and I don’t know her last name. Just curious if she’s hanging in there still. I went to elementary school with Ashley, we actually grew up together. We’re Facebook friends, she’s been clean and dating her elementary school sweetheart. i finally found her! I didn’t find much else out, but she looks happy and healthy, and her sister Nikki and herself seem to have repaired their relationship. She looks great, so I can only hope she is clean and gotten rid of that nasty cough. Ya know I was just hoping she didn’t die because she was so bad with the hack, etc. Hey guys! Talked to Ashley and got an update. She is still with her elementary sweetheart, she is doing good and is happy. I do not know how her family relationship is or how her cough is, but she seems to be better. And the best part is that she is clean! Just saw this episode. 2010, wow…awesome news she is doing well and hopefully she understands the inspiration she has given others. Also hopefully the relationship with her Aunt,Uncle and cousin and mom has healed. I just saw this episode tonight March 24, 2018 and I was so moved that I was dying to see her meet with her Aunt and sister after being clean at the program for a bit and knew she would be radiant!! Hope to God she’s still embracing the beautiful thing we call life. God Bless girl. I hope she is fine now, she is so beautiful. Looks like she is having a baby as of March 13 2019!